You will join over 5,000 satisfied customers who have used our online platform to teach themselves the art of dream control since 2013. The course is broken down into 10-minute lessons each night. And since it's a beautiful, responsive platform, you can learn on your tablet or mobile from the comfort of your couch in the evenings (we suggest a chamomile tea to go with it!). Deep relaxation - an essential precursor to dream incubation. Effective visualization - to create intricate dreamscapes while you're lying awake in bed. Dream chaining - how to lucidly re-enter a dream from which you've just awoken. False Awakenings - step by step techniques to convert them into lucid dreams. Nightmares - how to stop them and turn them to lucid dreams. Self Hypnosis - how you can plant the initial seeds of lucidity. Program Dreams in Advance - how to seed your desired dreamscape or dream plot. Summoning Dream Characters - and using your dreaming imagination to play with them. Seeking Wisdom From Your Subconscious - how to communicate with the inner awareness behind your dreams. Lucid Dream Therapy - how to help with anxiety, depression and phobias. When your order comes through, you'll be emailed login details to get unlimited lifetime access to all 30 modules of our platform. If you don't like the course, just let us know within 30 days and we'll give you a full refund - no questions asked. Lucid Dreaming Fast Track goes particularly well with Claridream PRO - the world's best lucid dreaming supplement. I followed the exercises and had my first lucid dream about six days into my practice. Now I am trying to get more consistent with having them. which like any skill takes practice. 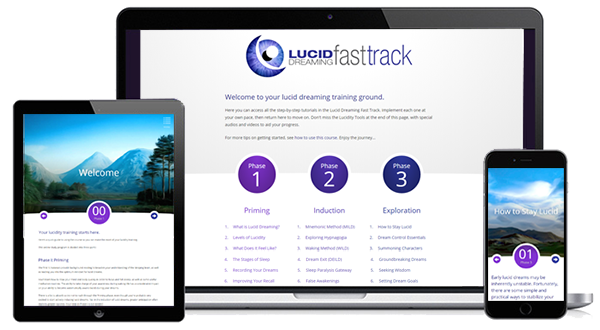 I sure appreciate the Lucid Dreaming Fast Track for helping me on my way! I’ve tried Claridream three times and had mixed results. I took one tablet the first two times and most definitely had a noticeable clarity and vibrancy to my dreams that isn’t usually there however it was quite short lived. The third time I tried two tablets and didn’t really notice any effect at all. I’m open to this being circumstance etc and will be trying again at which point I hope to come back with a more thorough review! This is a good class with interesting information. I was confused thinking it included the Claridream supplement but it doesn’t. That is only in the pro version. This was so much better than I thought it'd be ! I had a fly-lucid dream at the 3rd week of doing one lesson per day (if that's unimpressive: I hadn't had any for months before that despite obsessing). Really like the tools too, so useful ! When I started, I suddenly began dreaming every night, no lucid dreams at the beginning, but they'll follow, I promise!